The raspberry pi (rpi) is perfect to drive home built hardware. The lego mindstorms ev3 set with its LabVIEW based software is perfect to create simple controlling programs. And this software allows to send and receive messages by bluetooth. This lead to the idea to attach a bluetooth dongle to the raspberry pi and to add some software to receive and send ev3 bluetooth messages. bluetooth-agent 1234 &; hcitool scan; rfcomm connect hci0 aa:bb:cc:dd:ee:ff (using address displayed by hcitool scan). The rfcomm connect command should trigger a pairing key popup on the ev3 brick display, where the number given to bluetooth-agent has to be entered. (Key 1234 should be used because time to enter the key is limited and 1234 is the default key in the ev3 brick menu.) After successful pairing visibility can be switched off again. On the rpi /var/lib/bluetooth/…./ contains the settings for the bluetooth dongle. File config defines the bluetooth device name. For a simple test run the program shown below on the ev3 brick and use receive.py on rpi. Then start the program on the ev3 brick. This displays Hello world! on the screen of the ev3 brick. Important: Bluetooth only works if connections are always initiated from rpi and never from ev3 (brick or software: do not use the bluetooth ‘software brick’ of the ev3 software to connect or disconnect!) This is the result of current testing (firmware 1.03H or unofficial firmware 1.04H with support for edimax ew-7811un wifi dongle). – Initiating the connection from ev3 brick seems to change something in the bluetooth configuration of the ev3 brick which causes errors. A possibility to get rid of these errors is to delete the directories /var/lib/bluetooth/AA:BB:CC:DD:EE:FF on both devices. (Either needs shell access to ev3 brick; possible with wifi adapter and telnet: user root with empty password. Or use the ev3 software on your computer, open the memory browser of ev3 brick and download reset_bluetooth.rbf (source: reset_bluetooth.lms) to ev3 brick and use the ev3 brick menu to run reset_bluetooth.rbf) Then reboot the ev3 brick, restart bluetooth on rpi and do again the pairing process described above. Afterwards reboot the ev3 brick again. Instead of sending messages to the ev3 brick it is possible to use send.py to send commands (as described in reference 1 mentioned above). makes the LED pulse orange and led0.bin (with 0 instead of 9 as last byte) switches the LED off; (byte code reference 1: search for LED 2 : search for opUI_WRITE, 3: page 96 of firmware development pdf). Posted by spblinux on March 14, 2014 at 23:02 under Uncategorized. java programs for lego mindstorm ev3 with lejos firmware can be developed on the raspberry pi. This tutorial was used to get started. More about IDE Geany can be found on www.geany.org. Open geany and create a new project ev3. 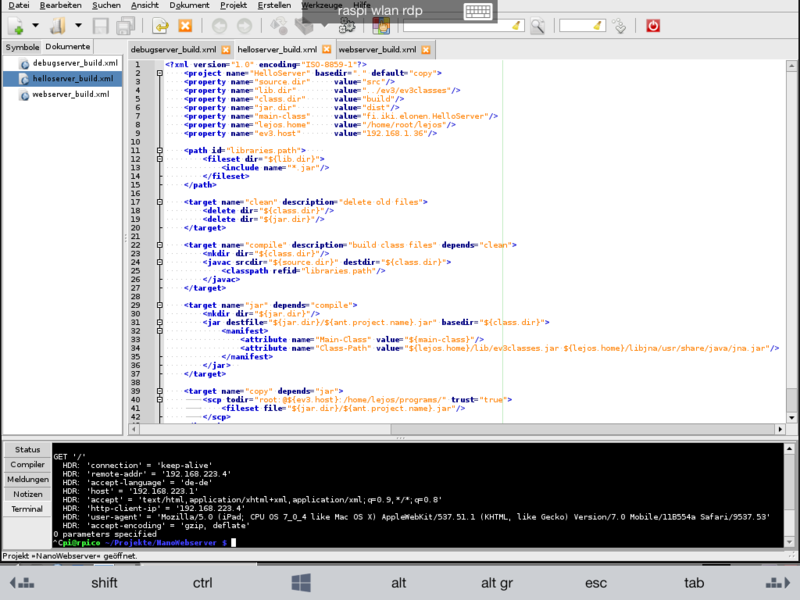 Open the file ev3/DBusJava/build.xml. Then open the Terminal tab at the bottom of the geany window. If the command did complete successfully use cd to change into ev3classes directory and open the file ev3/ev3classes/build.xml from geany menu. Use scp to copy some example project from eclipse to geany. Create a new geany project with the same name. Use command ant jar in geany Terminal to compile the project. Finally use ant copy to transfer the jar archive to raspberry pi. Posted by spblinux on March 9, 2014 at 12:37 under Uncategorized. Mathematica comes preinstalled on raspbian and is free for personal use. Adding a vnc or rdp server to a raspberry pi running raspbian allows to display and control Mathematica with an iPad. If the raspberry pi is configured as wlan access point you get a free and rather mobile installation of Mathematica. Required hardware: raspberry pi model B, 16 GB sd(hc) card (at least 4 GB), ew-7811un wireless usb adapter; device running a vnc or rdp viewer (e.g. iPad with RD Client app). (ios clients seem to be picky about non standard network masks. So configure wlan0 with 255.0.0.0 and adapt dnsmasq.conf. try to join wlan Himmbeerhacks and try to connect with rdp to 10.0.0.1 or open 10.0.0.1:5901 with a vnc viewer (like RD Client or Remoter VNC on iPad). Further trial and error shows that with a bluetooth keyboard rdp works better than vnc. Especially square brackets (alt+5, alt+6) do not work well with vnc – at least in my setup with locale swiss german. That is why I started to use xrdp and the free microsoft remote desktop client for iOS. Posted by spblinux on March 5, 2014 at 21:12 under Uncategorized.